DIVISION OF LABOR — During Timucua times, there was a separation of duties between the sexes. The men built huts, made tools and weapons, fished, supplied most of the land animal meat by hunting, defended the home village, and attacked neighboring villages. They also taught boys what they needed to know to shoulder adult responsibilities. Women trained girls in the skills that they needed for life. They also looked after the children, hunted small animals, gathered roots, collected shellfish, and performed most of the chores related to the upkeep of huts. 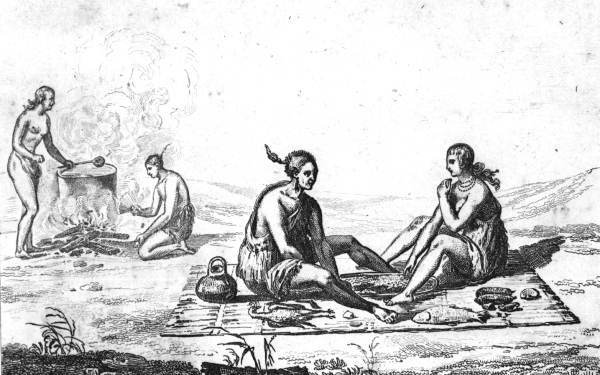 Furthermore, women sewed clothes, weaved baskets, crafted pottery and tools, prepared medicine, fetched water, cooked food, ground corn, and gathered nuts, berries, and other edibles from plants. Men enjoyed more free time, playing in the shade with youngsters. However, their responsibilities often proved more dangerous and physically demanding. So there was a trade off, with women busier but safer. This type of arrangement has been seen in many other cultures with less developed technology. INTERESTING FACT — The Timucua used an animal’s brain to preserve its hide. This was a process called “brain-tanning.” Brain matter was rubbed into the hide to keep it from rotting. In other words, the hide was cured into leather.